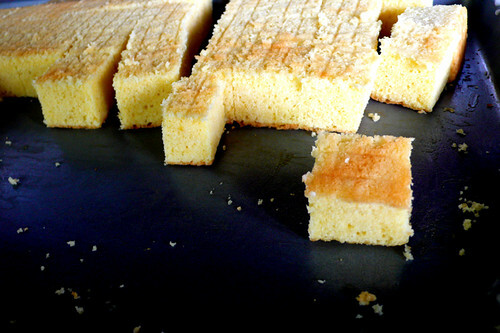 when making petit fours, it is easiest to bake the cake in square/rectangular pans, then cut the pieces down to size. i cut these squares down to 1 1/4"x1 1/4", and used a pound cake recipe (found here), because i like how sturdy the cake is, without being dry. it’s easier to cut the cake when it is completely cooled–refrigerated or frozen is even better.